Well I had a busy day on Saturday both entering and judging at local shows. I was on a pretty strict timetable until mid morning, I went down to Otley market to do my weekly food shop, Helen picked me up and drove me to Ilkley where I entered ten different things in Ilkley Flower Show. I’ve never been to Ilkley Show before, let alone entered so I wasn’t sure what I would be up against. I entered four photographs and the rest in handicrafts. I then took a bus over to Addingham to be ready to start judging at 10.30! Judging went pretty smoothly with just a couple of things for my assistant to sort out. The hardest bit was choosing the ‘homecraft’ cup. This is awarded to the best in show in the handicrafts, baking and home preserves classes, so the three judges have to get together and agree on the winner. We, the judges, felt it was impossible to fairly judge between a cake, a jar of jam or a piece of embroidery or craftwork which has taken hours and hours to make. As handicrafts won last year I said I felt maybe this year it should go to one of the other areas, however the other judges said no, handicraft wins hands down. We did speak to the organiser to say they really need to have three individual cups, one for each section. After a lovely lunch I caught the bus down to Ilkley to see how I had fared there. I was well chuffed to see I’d won a prize with six entries, though not necessarily with the ones I thought would do well! The first photography class was entitled ‘Looking Up’. I entered two photos of Beverley Minster, I particularly like the first one, but neither of them were placed. 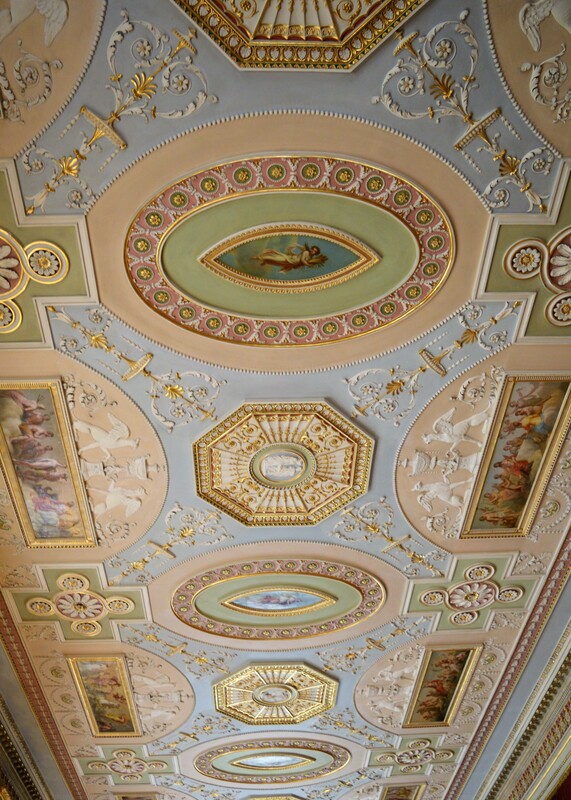 However my photo of the ceiling at Harewood House which I put in at the last minute came second! There was also a novice class for anyone who has never one a photographic prize at Ilkley Show. The title was ‘A Splash of Colour’ so I took a photo of my box of perle threads. This won second prize. I won first prize for my dress made from a vintage silk sari in the class for ‘Something New from Something Old’ I made this a few months ago from a sari I bought on ebay for about £12. The poppy embroidery I had made specially for the show wasn’t placed in the Embroidery Class, but the embroidery of Catbells on a wooden reel came third! The three cross-stitches I entered were fairly small so I wasn’t convinced I’d get anything, but I won first prize for my hardanger sampler and third for my cross-stitch box. It just shows that it’s always worth popping an entry in, even if you think it’s unlikely to get anywhere, you just never know how a judges mind works! Congratulations and well done! Very well deserved and you should be very pleased! Hurrah for you! I’ve seen that happen so many times, the thing you enter as an after thought or because you like it wins and the one piece that you think is your best work does nothing! Still, it is fun to participate. Our county fair entries are due this Thursday, so I have a pile forming in the living room.😊 I might even try a loaf of bread this year….or maybe some bagels, just to do it! Congrats, and I totally agree with the sari, it is an inspiration!